In October 2015, the U.S. EPA lowered the ozone National Ambient Air Quality Standard (NAAQS) by 5 parts per billion. To characterize ground-level ozone, researchers are turning to resources provided by NASA. Located right on the shores of Lake Michigan, the small town of Sheboygan, Wisconsin, is a popular tourist destination. Surprisingly, though, Sheboygan County is also the site of one of the state’s biggest air quality concerns: ozone pollution. Tracey Holloway, deputy leader of AQAST, chaired the 2015 Energy Summit at UW-Madison, an annual conference organized and hosted by the Wisconsin Energy Institute (WEI). Watch this video to learn more about AQAST members in the final year of this program. How does energy use affect global health? A new study led by Dalhousie University quantifies the response of global premature mortality rates to reduced emissions of SO2, NOx, ammonia, and carbonaceous aerosols worldwide. AQAST partnered with the San Joaquin Air Pollution Control District (SJAPCD) to sponsor the first Transboundary Ozone Pollution Conference, hosted at the Tenaya Lodge near Yosemite National Park. Several AQAST members are supporting an intensive study aimed at improving scientific understanding of winter air quality along the east coast. Can smoke from fires intensify tornadoes? “Yes,” according to a study led by Gregory Carmichael, AQAST member and professor at the University of Iowa. Satellites planned for launch during the next several years could greatly improve air quality forecasting worldwide, according to a new study led by Gregory Carmichael, a professor at the University of Iowa and AQAST member. The Ozone Garden established by Saint Louis University’s (SLU) Center for Environmental Sciences in 2012 has set an example for science education that is being replicated in other cities around the country. 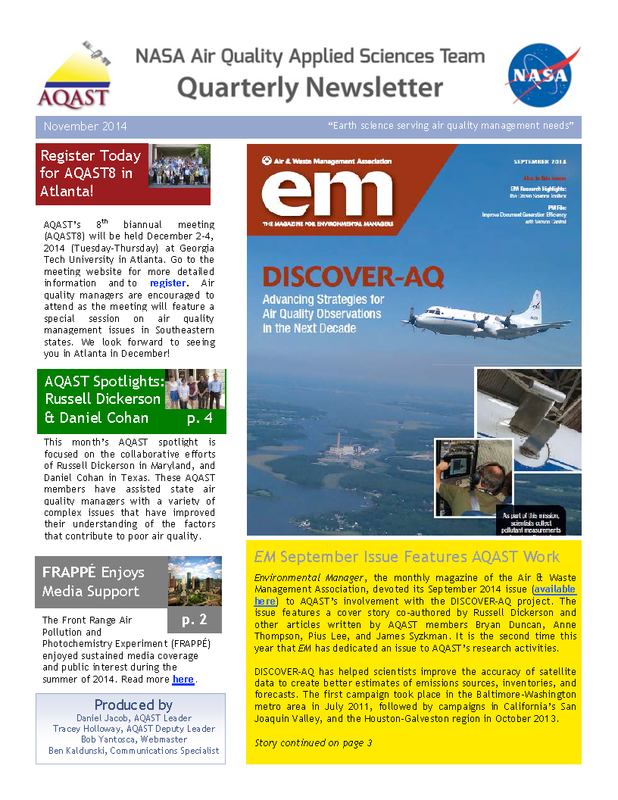 Work by several AQAST members was featured in the September issue of Environmental Manager (EM) magazine with a special focus on their role in supporting the DISCOVER-AQ aircraft campaigns. 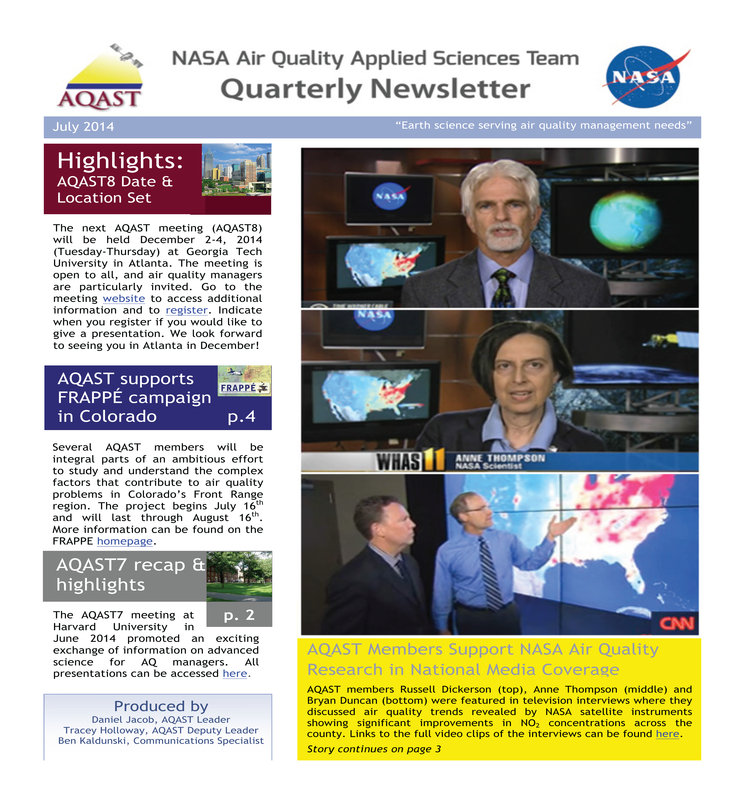 Several AQAST members played integral roles in supporting a groundbreaking campaign aimed at improving scientific understanding of the factors that affect air quality in Colorado’s Front Range region. Members of NASA’s Air Quality Applied Sciences Team (AQAST) are using satellites to monitor emissions of methane, formaldehyde and NO2 from oil and natural gas extraction and distribution to help air quality managers in regions that have experienced rapid growth in those industries. Ozone gardens at the University of Colorado-Boulder’s Museum of Natural History and the National Center for Atmospheric Research (NCAR) Mesa Laboratory are illustrating the harmful effects of air pollution on human and plant health. The Front Range Air Pollution and Photochemistry Experiment (FRAPPE) is designed to measure pollution that accumulates in the Rocky Mountain’s Front Range region that prevents the area from complying with National Ambient Air Quality Standards (NAAQS) established by the U.S. EPA. 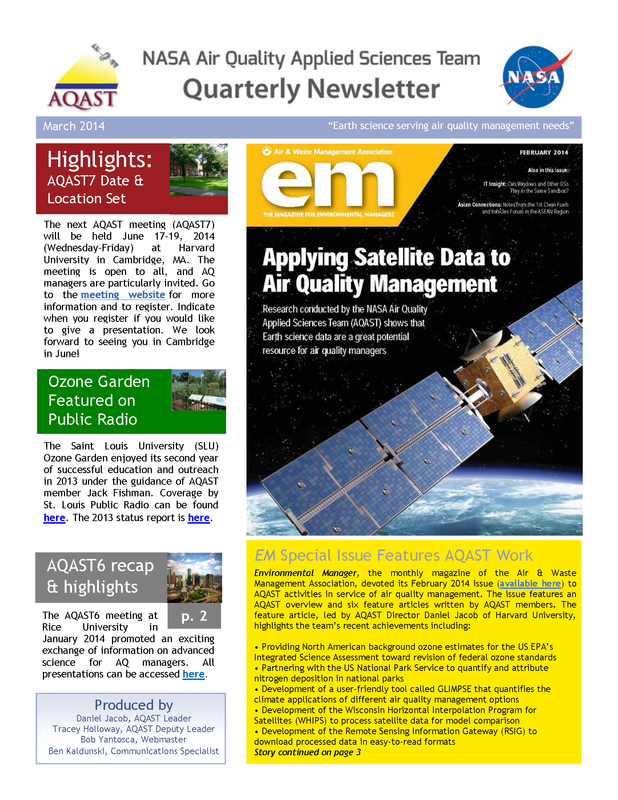 AQAST will hold its seventh biannual meeting next week in Cambridge, Massachusetts, with presentations from leading experts with direct applications for air quality managers and other stakeholders. 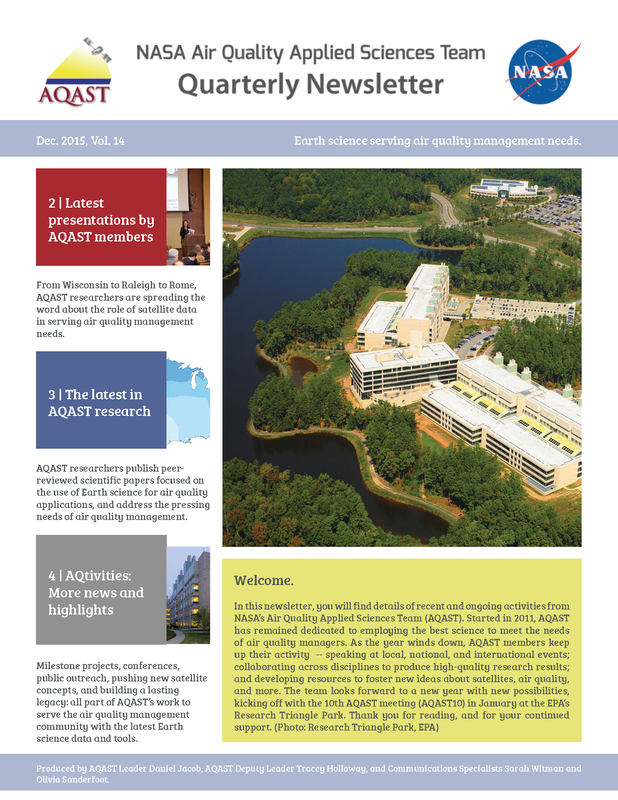 A team of several AQAST members produced a comprehensive guide for air quality managers that has been accepted for publication in the peer-reviewed journal Atmospheric Environment. AQAST members will meet with air quality managers from midwestern and central U.S. states next week in St. Louis, Missouri, to share research on a variety of research projects and air quality issues. National efforts in the last decade to clear the air of dangerous particulate matter have been so successful that most urban areas have already attained the next benchmark, according to new research by Rice University. Several members of NASA’s Air Quality Applied Sciences Team (AQAST) will be presenting research during an international conference hosted by the Royal Netherlands Meteorological Institute (KNMI) from March 11-13. Recent work by AQAST members seeks to understand the variability and major sources of uncertainty in using models to estimate the role of foreign and natural sources that raise U.S. ozone smog levels in surface air. The Saint Louis University (SLU) ozone garden enjoyed its second year of successful outreach and education by showing how ozone pollution affects plant life, while expanding to two additional locations. New air quality modeling techniques developed by NASA’s Air Quality Applied Sciences Team (AQAST) reveal the high public health costs associated with ammonia emissions from U.S. agricultural exports. The total amount of ground-level ozone pollution that affects human health can vary widely depending on geography, seasonality and meteorological conditions. Preliminary results of a comprehensive study of air quality in the Houston metro area known as DISCOVER-AQ were revealed last week during the sixth biannual AQAST meeting. AQAST has developed a tool aimed at helping air quality managers measure and predict ground level visibility using satellite data to compliment surface measurements. AQAST will hold its sixth biannual meeting next week in Houston, Texas, with presentations from leading experts with direct applications for air quality managers and other stakeholders. Power plant emissions of sulfur dioxide – an atmospheric pollutant with both health and climate impacts – have increased across India in recent years, according to a new analysis of data from a NASA satellite. After countless hours of work and a lengthy revision process, the NASA AQAST “Tiger Teams” can now get to work on implementing the proposals they submitted to help solve problems in the air quality management community. Thirty-eight U.S. national parks are experiencing “accidental fertilization” at or above a critical threshold for ecological damage, according to a study published in the journal Atmospheric Chemistry and Physics. Research by environmental scientists at the Harvard School of Engineering and Applied Sciences (SEAS) brings bad news to the western United States, where firefighters are currently battling dozens of fires. As the sun sets on July’s last remaining days, the founders of the St. Louis Ozone Garden look back on several successes from the garden’s second season. Today, nine members of NASA Air Quality Applied Sciences Team (AQAST) and other researchers release a paper that reviews the ability of satellites to estimate U.S. air pollution emissions. 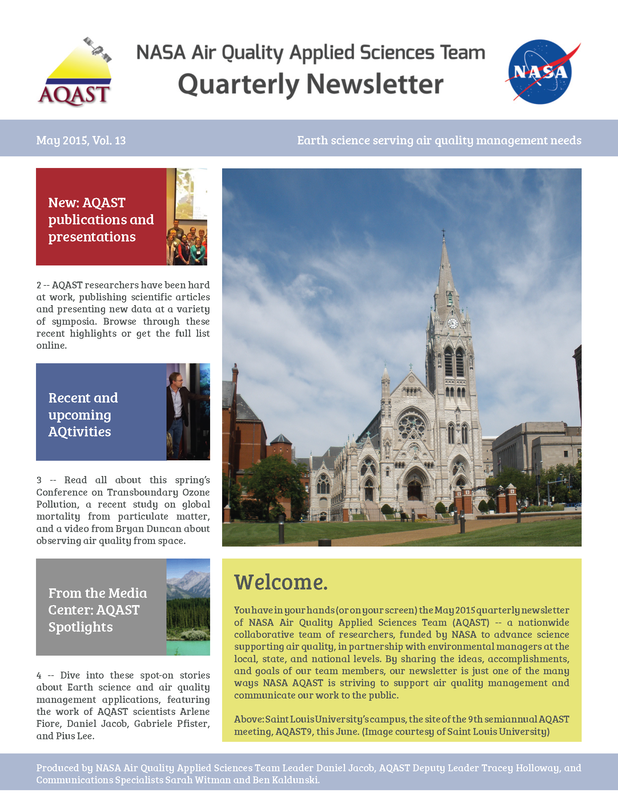 NASA Air Quality Applied Sciences Team (AQAST) celebrates the completion of its fifth biannual meeting, AQAST5, which took place last week, June 4-6, at the University of Maryland. This week kicks off the public comment period for a document concerning an air quality exceptional event that took place last summer. As AQAST members continue to think up new ways to address pressing air quality research problems, they are reaching out to air quality managers to help decide which topics are most deserving of funding. Nearly a year has gone by since St. Louis witnessed the completion of its first-ever ozone indicator garden, and now the project’s organizers are looking forward to the start of a new growing season. Tackling big issues like climate change, air pollution, and forest fires is hard enough without unsightly pixels clouding your view. Reducing the impacts of climate change, long seen as a daunting task, may be more manageable than ever with insight from a new study led by two American researchers.